Wrapping themselves in the national flag, Brazilians swarm city centers. Wrapping themselves in the national flag and shouting “Out Dilma!” and “Impeachment Now,” Brazilians swarmed city centers across the country on Sunday to demand the ouster of their president. Dilma Rousseff, Brazil’s embattled leader, was the main target of demonstrators in cities across the country, from Belém in the impoverished northern Amazon region to Rio de Janeiro’s fashionable Copacabana beach and middle-class enclaves in the southeastern cities of Belo Horizonte and São Paulo. According to Brazilian media and on social networks, protests were staged in all of Brazil’s 26 states, as well as in the capital district of Brasília. In the city of São Paulo, the antigovernment protest was the second-largest since March, with estimates ranging from 135,000 to 350,000 protesters on Avenida Paulista on Sunday afternoon. The military police said that about one-million people participated in a March demonstration in the city. Police said that some 275,000 protesters had gathered at Paulista during a subsequent demonstration in April. Marchers also denounced widespread corruption among the country’s political and business elites and called for the end of more than 12 years of rule by Ms. Rousseff’s leftist Workers’ Party, known as the PT. A representative for the president said her administration wouldn’t comment on Sunday’s demonstration. Sunday’s demonstrations appeared to be overwhelmingly peaceful. In São Paulo, orderly but impassioned marchers chanted anti-Rousseff slogans, blew whistles and tooted vuvuzelas horns as police, some in full riot gear, stood by. 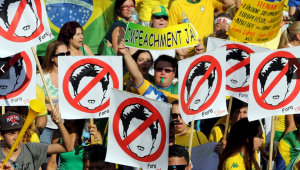 Many protesters carried placards demanding that the president be impeached. Others called for the military to topple the government and set up new elections. Neide Cordeiro, a 43-year-old small-business owner, said such an intervention is the only way to save the country. National opinion surveys indicate a majority of Brazilians favor democracy over other systems of government. But a poll by the Datafolha polling firm showed that 10% of demonstrators taking part in a protest last March would support a dictatorship under certain circumstances.